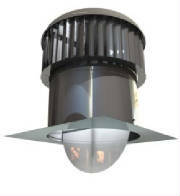 The Hurricane™ Turbine is a wind driven roof exhaust fan. The natural ventilator is alternative to traditional industrial ventilators that perform poorly and consume energy. Natural Ventilation is proven to be effective and keep costs down. Click Here for Hurricane Specs.